Two late tries by Justin Tipuric and Rhys Webb earned Ospreys a bonus point win away at Italian side Treviso to move them up to second in the Pro12. Wing Eli Walker's score just before the break had given the Welsh side an 11-3 lead. Simone Ragusi's try and Jayden Hayward's boot kicked Treviso 13-11 ahead as Ospreys had prop Nicky Smith and then Webb sin binned. But tries from Dan Evans, Tipuric and Webb sealed the points for Ospreys. The result leaves Steve Tandy's Ospreys four points behind leaders Glasgow who thrashed Cardiff Blues 36-17, with the two sides behind them, Ulster and Munster, in action on Saturday. Treviso remain 11th in the table, four points above bottom side Zebre. Dan Biggar and Jayden Hayward exchange penalties early on at the Stadio Comunale di Monigo, as Treviso frustrated the Ospreys attack with some spirited defending. But midway through a scrappy first half the Italians went down to 14 men as centre Enrico Bacchin was shown a yellow card for failing to release an Ospreys attacker. Biggar slotted over the resulting penalty, but those were the only points the Welsh side managed with Bacchin off the field. The breakthrough came just before the break as Walker penetrated through the Italian side's defence from close range, but Biggar's conversion attempt hit the post. Ospreys' scrum struggled against the Italians' pack and just a minute into the second half prop Smith was sent to the sin bin. A relentless tide of attacks were repelled by the Welsh side's defence as Treviso tried to make their extra man count. After several phases the ball was spread wide to replacement centre Ragusi, who dived over in the corner with Hayward adding the conversion from the touchline. Seconds after Smith returned to the field Webb was shown a yellow card for a high tackle on Ragusi. Hayward kicked the penalty to put the Italians 13-11 in front for the first time on 52 minutes. Biggar missed the opportunity to put his side back in front on 62 minutes as he sent his penalty wide of the post. Three minutes later Walker cut through the Treviso defence and was stopped just short of the line, with Evans picking up to go over for his try. However, Biggar missed the conversion. 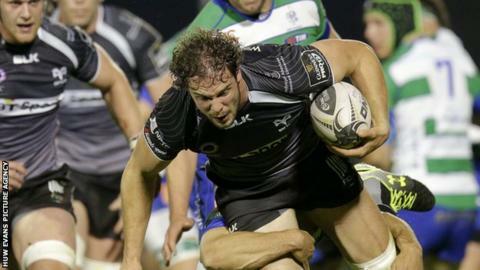 The Wales outside half made amends as he added a penalty on 71 minutes to give Ospreys an eight-point lead. With three minutes left Tipuric and Webb exchanged passes before the scrum-half's reverse pass sent the flanker clear, with Biggar adding the conversion. Wing Tom Grabham made a last-minute dash out wide and passed to Webb inside, who used his strength to touch down and earn Ospreys the bonus point, with Biggar kicking the extras. Webb's late try was the 26-year-old's ninth in the Pro12 this term and means he now holds the record for the most league tries in a season for the region. Benetton Treviso: Hayward, Pratichetti, Morisi, Bacchin, Nitoglia, Christie, Gori, Zanusso, Giazzon, Harden, Fuser, Van Zyl, Derbyshire, Minto, Luamanu. Replacements: Cattina for Derbyshire (2), Derbyshire for Cattina (11), Ragusi for Morisi (28), Morisi for Ragusi (36), Ragusi for Morisi (41), Cattina for Derbyshire (51), Anae for Giazzon (62), Pavanello for Van Zyl (62), Acosta for Zanusso (71), Muccignat for Harden (71). Ospreys: Evans; Grabham, Spratt, Matavesi, Walker; Biggar, Webb; Bevington, Baldwin, Jarvis, Wyn Jones (capt), Ardron, Lydiate, Tipuric, Baker. Replacements: Smith for Bevington (41), Bevington for Baker (43), Arhip for Jarvis (51), Baker for Bevington (52), Peers for Ardon (61), King for Lydiate (71).